But generally, my sewing projects as far as clothing goes? Not so much. Actually, more like disaster central. For some reason it’s really, REALLY difficult for me to follow a sewing pattern, unless it’s one I made myself. Add something into the mix with moving parts that also requires following more instructions like a SEWING MACHINE and you have Beretta’s brain completely explodes. So, as I am only beginning to grasp the concept of machine-sewing, and starting slowly with toys and hemming dresses, I’ll refer you instead to a gal who’s been sewing with confidence and using patterns for quite some time. Meet Casey of Elegant Musings. Her wonderful blog has this great post, “The Vintage Pattern Primer” and more posts about drafting your own 50’s dress pattern for those interested in going truly vintage or who want to step their sewing up a notch. Where do I start? How do I use a vintage pattern? What about sizing? Any tips? I really appreciate that people ask me–vintage sewing patterns are something I love working with and enjoy sharing that magic with others. I thought it would be nice to compile my tips and resources all in one post. Vintage patterns can come off as intimidating to not only those new to sewing, but seasoned dressmakers as well. The instructions look like a foreign language, there are so many steps, and the pattern pieces sometimes don’t even have any markings! I started sewing with vintage patterns about 7 years ago. I didn’t really know what I was doing (and it can be argued I still don’t. lol! ), so my learning process has been through a lot of trial and error. 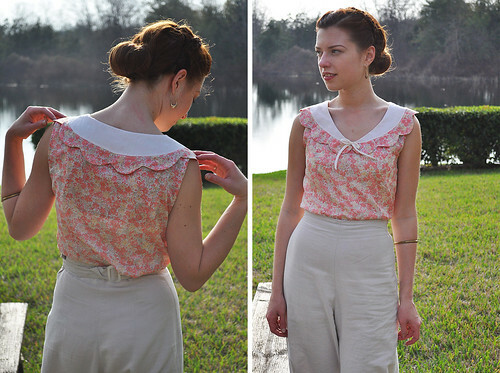 I hope these tips will be helpful to those thinking about trying a vintage pattern. 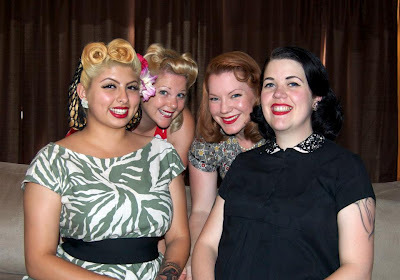 Read the full Vintage Pattern Primer here! Love the top in the pic? Get the tutorial here! It’s not a vintage pattern, but the neckline gives it a modern feel, so it’s a good place to start if you’re not ready to tackle the dress. Happy Sewing! If you have any comments about your sewing with pattern experiences, I’d love you to share them in the comments. I thought I’d never be able to sew with (non-vintage) patterns but I’m learning bit by bit! A good tip is to find an independent pattern designer you like (Sewaholic, Colette, Megan Neilsen) and then if you have any trouble you can just email them because they’re real people! But I’ve found their instructions are really clear anyway. One day I’ll tackle vintage patterns so thanks for the link!